A month ago I had a "THAT'S IT!!!!!!" moment. If you are a parent reading this, I'm sure you know what I'm talking about. My husband and I took the 3 littlest kids to a great park not to far from our house. Finley started playing right away, running up and down the ramps, climbing stuff, sliding. You know park stuff. Fletcher just kind of stood there. Looking grumpy, looking annoyed, looking miserable. He's 4, he is nowhere near too old or too cool to enjoy a park, but he was acting like it. It made me upset. It made me a little angry. Honestly, it made me sad for him. I wanted him to go out and have fun. To burn some energy, to climb, to slide, to collect rocks. You know, park stuff. In that moment I decided that the iPad was rotting his brain. So I declared, loud and proud, "NO iPAD for 1 month". Since my kids have no concept of time, Fletcher said "No iPad forever?" Basically. Since waiting 5 minutes for a snack often feels like forever to a 4 year old, he had the right idea. So before I get into how the month went I'd like to rewind a bit to give a back story. We started using the iPad with Fletcher when he was around 10 months old. He wasn't trolling the internet or anything. We would just put the Frozen song "Let it Go" on while we would cut his fingernails. It kept him distracted and stopped him from squirming. The only time Fletcher used an iPad this last month. At the library playing an educational game with his best buddy. Then during the toddler years, we started watching the Baby Bum Nursery rhymes. It was like crack to him. He would just stare and get into a trance. But he didn't watch very long, and I had just had another baby so the distraction was much needed. I was able to nurse Finley while he watched a little "Johnny, Johnny! Yes, Papa". Harmless right? Fast forward another year and somehow, he had started watching videos on YouTube of other kids playing with toys. His new crack. Finley started watching them too. This is like a thing. Kids watching other kids play with toys, video games and opening new toy boxes. I honestly don’t get it. Not one bit. But it’s like SUPPPPPPPPPPPPPPER popular, these people are getting zillions of hits on YouTube. So the thing is Fletcher was watching these videos and at first I thought it was extremely dumb, but also harmless. They weren’t swearing, they weren’t blowing things up. They were just playing. But then I started noticing more and more that when we would play together he would want me to actually play for him. If I set up a painting activity he’d want me to paint for him. It baffled my mind a bit. Four year olds should know how to play, right??? Should be as natural as breathing, you’d think. My iPadless kids. Aren’t they cute? It wasn’t just Fletcher that was the issue though. Finley had developed a serious addiction as well. I was 100% completely to blame for this and I felt like such a failure. When Ophelia was born, I had some major struggles at the beginning. Nursing didn’t go as planned, something that had come so naturally to me and my other children. So I was pumping and trying to nurse and just trying to figure out this new, weird baby. The iPad helped me through this time. It really did. It used it to keep Finley entertained when I had to go up to Ophelia’s room just to nurse her in the darkness. Or when I had to sit and pump for hours throughout the day. I just couldn’t entertain Finley as much as I would have liked. We had a playdate once with one of Finley’s friends and although she played with her, she also carried her iPad around with a show playing in the background. It was like a comfort to her or something. I don’t know. To me it was just embarrassing. Made me feel like such a failure as a mother. I am sad just thinking about this. So back to the park. I decided without reservation that I would get rid of the iPad. I said for a month but in my head I was thinking, maybe even forever. Perhaps I’d steal it back and use it at night to read an e-book even. Who knows! I also stated there would be no more YouTube at all. Not on the iPad, not on mommy’s phone, not on the TV. No more. It was clearly rotting Fletcher’s brain or at least his ability to play like a normal 4 year old. And although by this point Finley’s addiction had gotten a lot better, I felt like it would benefit her as well. The first 4 days Fletcher and Finley both asked if they could watch the iPad. But, I kept them entertained with lots of activities. Yes, this punishment was a lot more work for me; at least at the beginning. I didn’t have those lovely breaks where the kids would sit in a trance and I could make dinner uninterrupted. Colouring blocks. Legit had them entertained forever. The first day we coloured some of our plain blocks and made them look like actual buildings and other random things. Both kids loved this and did it for what seemed like hours. The following day we made a robot out of an old box. The kids chose different materials to decorate it and they also painted it. It was definitely a guided activity with lots of help from me but a successful one none-the less. Since we started this during summer vacation from school we also took the kids on lots of outings. We went to Centre Island, Wildhagen Adventure Gardens, Bronte Creek and more. We were pretty busy and enjoyed lots of time swimming and playing outside. Fun at Wildhagen Adventure Gardens. The best thing about this whole thing was eventually the need to constantly entertain Fletcher and Finley started to dissipate. I found them playing better together, using their imaginations more. They would take turns pretending to be Marshal or Ryder from Paw Patrol. One would pretend to fetch something while the other shouted out missions. 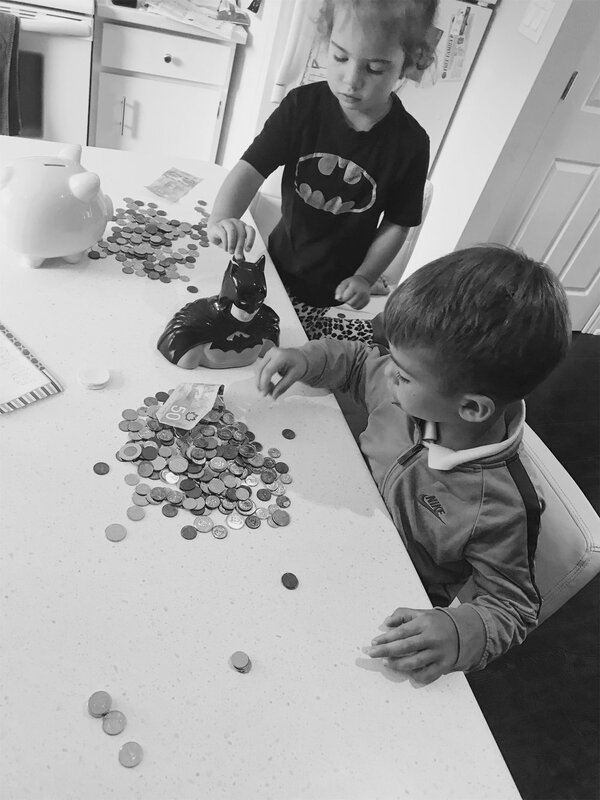 One day they both got out their piggy banks and counted and sorted all of their coins. Yup, they came up with that activity all on their own. They built a slide out of their car mat and our stairs. Doesn’t sound very safe but if you saw how slow they went down you wouldn’t worry. They giggled for hours “sliding” down it and then inviting all of their stuffed animals to join in on the fun. That was truly music to my ears. That was what I wanted to hear, what I needed to hear. Kids playing, imagining, sometimes fighting, but at least not over some device that puts them into a trance. Fletcher has even learned to enjoy parks again, success! I don’t plan on giving the iPad back anytime soon. They don’t ask anymore and I don’t see it being beneficial at all to them. If I ever do, I’ll be deleting YouTube and Netflix first. I am so glad I made the abrupt decision to get rid of it. I honestly think my kids are glad too, but don’t mention it to them.